Perhaps because of the word “Ensemble,” the images most members would associate with our CCA are probably:1) an entire ensemble packed onto stage, simultaneously tickling the ivories of ten grand pianos, or 2) about twenty people squeezed shoulder-to-shoulder at the keyboard of a grand total of one piano, each passionately banging away at about two keys each. Sounds familiar? If it does, don’t worry, you’re not alone! About the whole of PE Batch ‘13 was with you in our first impressions. As much as the Piano Ensemble would like to offer such a visual spectacle, we don’t have quite enough space or resources to put up such a show. Still, though we might not be able to stage a 30-something hand masterpiece, rest assured, we certainly do more than the usual solo playing! In their two years here, members have the chance to perform duets, duos and even triets with other like-minded piano enthusiasts, batchmates and friends. Engaging, fun, yet professional – or at least, what we feel to be so – this CCA hopes to fill what usually is a technically demanding process of practising an instrument, with plenty of enthusiasm and interest. After all, quality does come over quantity. And quality is definitely something that we strive for, be it in our annual concert, competitions or smaller-scale recitals. 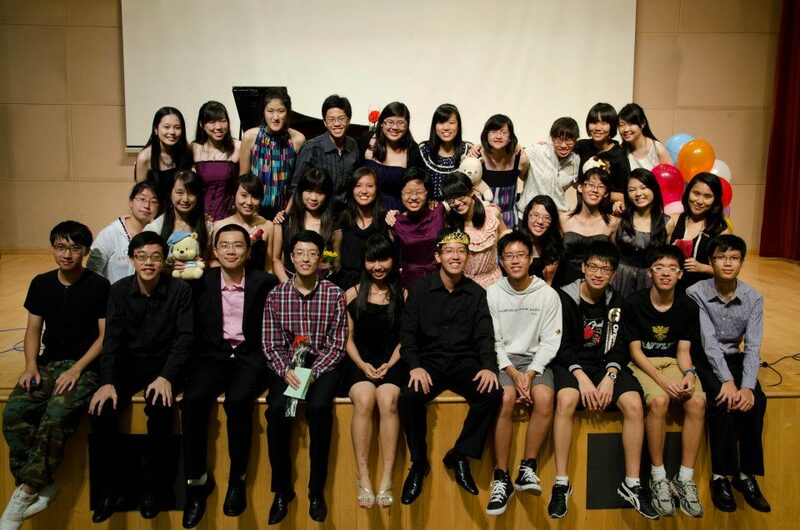 This is evident by the consistently stellar results attained by the CCA’s members in the annual inter-JC piano competition – Vivace, the pianistic equivalent of the SYF – for which we are happy and thankful that we have been clinching the gold award every year since we first participated in 2005. The ensemble’s endeavour for excellence is also reflected in its innovative and out-of-the-box concert themes, which include “For Euridyce” (2005), “Child’s Play” (2009), and most recently, “Légende” (2012). As German poet Berthold Auerbach once said, “Music washes away from the soul the dust of everyday life.” If you’re wondering what else we engage in apart from performances and competitions, RI PE is also heavily engaged in community service, in hopes of sharing and spreading our passion for music to others, and, in doing so, help them discover the profound healing powers of this medium for emotion. Each year, our CCA undertakes several different types of projects with different beneficiaries every year. These comprise giving monthly hour-long lunch-time recitals at the Singapore General Hospital as well as offering weekly piano lessons to the children of Chen Su Lan Methodist Children’s Home. And what can you expect from our weekly CCA sessions? We’d really like to think that anything goes – planned sessions with Master classes, musical sharing, rehearsals and even the much-feared pre-concert Quality Control checks will definitely be on the programme. However, just as much, if not even more time will be devoted to batch planning, discussions and even just bonding time, because the direction of any CCA is ultimately determined by all its members. You can expect spontaneous improvisations, spontaneous practices, and a lot of laughter and inside jokes forming. So if you are a piano enthusiast seeking to showcase and develop your pianistic talents, or a compassionate pianist who wishes to propagate love through music, or a hobby player who’s simply bored of playing the piano alone, then look no further, the doors of Piano Ensemble are wide open for you! Be it molecular biology, ecology or the ever-popular medicine, the Raffles Society for Biological Sciences (affectionately known as ‘Biosoc’) caters to all interests in the wide field of Biology. Much to the dismay of some, the club does not spend 2 hours every Thursday ‘mugging’. Instead, members delve into any aspect of Biology that is of interest. As a completely student-planned and student-run CCA, the content of sessions is highly flexible. The topic for the day could be a member’s pet interest, a presentation of another’s scientific research or an in-depth analysis of the latest biology-related news.